Breathe California is proud of its century of successes in the areas of public policy, health education and the providing of critically needed health services. The inspired and groundbreaking work of our local offices is fueled by a familiarity with our neighbors' unique strengths. Our goal of improving their quality of life by promoting healthier lungs on a both a personal and community level has changed many lives for the better. While our statewide advocates work for the welfare of California as a whole, and Breathe California staff members who work on task forces influence important decisions about local health issues, our base point of contact with those we serve is our local office. This is where we identify a community problem or need, determine the best way to address it and find apppropriate sources of funding which will allow us to develop and implement programs and services to help. 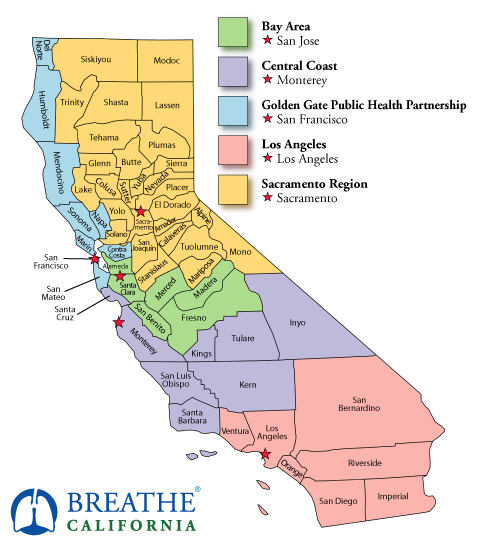 Click your county on the map below to be directed to the website of your local Breathe California office.